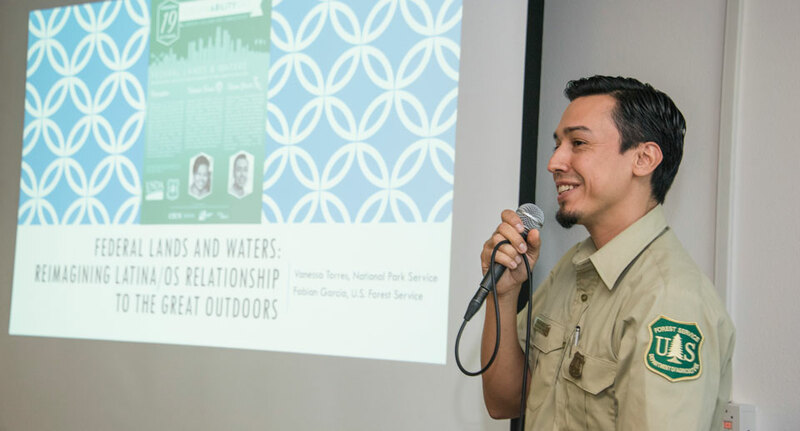 Fabian Garcia, representing the U.S. Forest Service, caps CSUN’s ninth annual Sustainability Day with an inspiring and candid session encouraging Latino students to consider careers with the Forest Service and NPS, and to take advantage of public lands. The Oct. 19 event was organized by the Institute for Sustainability — and co-sponsored by the University Student Union and CSUN’s Civil Discourse and Social Change program. Photo by Lee Choo. Vanessa Torres of the National Park Service (NPS) caps CSUN’s ninth annual Sustainability Day with an inspiring and candid session encouraging Latino students to consider careers with the Forest Service and NPS, and to take advantage of public lands. The Oct. 19 event was organized by the Institute for Sustainability — and co-sponsored by the University Student Union and CSUN’s Civil Discourse and Social Change program. Photo by Lee Choo. Helen Cox, director of CSUN's Institute for Sustainability, and Chicana/o studies professor Stevie Ruiz -- who brought students from his Environmental Justice class to the event -- confer before the start of the Sustainability Day session, "Federal Lands and Waters: Reimagining Latina/os Relationship to the Great Outdoors," on Oct. 19. Photo by Lee Choo. The “we” Garcia spoke to and hoped to draw to the forests, the mountains — and the state and nation’s public lands in general — were Latino young adults, particularly California State University, Northridge students. The CSUN student body boasts a 44 percent Latino population and demographics that reflect Los Angeles itself. Garcia, representing the U.S. Forest Service, and Vanessa Torres of the National Park Service (NPS) capped CSUN’s ninth annual Sustainability Day with an inspiring and candid session encouraging Latino students to consider careers with the Forest Service and NPS, and to take advantage of the public lands near and far. The Oct. 19 event was organized by the Institute for Sustainability — and co-sponsored by the University Student Union and CSUN’s Civil Discourse and Social Change program — and attracted a standing-room-only crowd of more than 200 students and faculty members. “Being outdoors, hiking a trail, is where you get your head straight again. Mother Nature speaks to us somehow — it’s where you find that clarity,” said Garcia, who grew up in the small town of Dinuba in the central San Joaquin Valley, as the son of immigrants from Jalisco, Mexico. He attended UCLA as a first-generation college student — like many CSUN students — and earned a bachelor’s degree in Chicana/o studies, with a minor in Spanish. Then, a diversity recruitment program and the opportunity to earn a certificate in nonprofit management at Fresno State helped Garcia get his foot in the door at the Forest Service, he said. “In Dinuba, we grew up about 40 minutes from the giant sequoias,” said Garcia, now director of the Southern California Consortium for the Forest Service, part of the agency’s Outreach, Recruitment and Workforce Diversity office. “We were right at the gateway to the sequoias.” Yet, few young people from his community aimed to work in the national forest or national parks, he said. In his position, Garcia serves as liaison between government agencies, nonprofit organizations, local businesses, school districts, and colleges and universities. “Our motto in the Forest Service is, ‘caring for the land, serving the people,’” he said. “It’s a big gamut of careers. What we’re trying to do is increase interest [among students from underrepresented groups] in the sciences — such as hydrology and geology. Torres, who is the Los Angeles district supervisor for the nearby Santa Monica Mountains National Recreation Area (part of NPS), also serves as chair of NPS’ Latino Employee Resource Group. After working at Grand Teton National Park in Wyoming, Torres started doing diversity recruiting for NPS, she said. “A lot of people of color don’t prioritize going to the outdoors,” Torres said. “But we’ll save money to take our family to Disneyland.” When it comes to public lands such as national parks and forests, Latino families still don’t see those resources as their own, she said. Torres and Garcia said they hope to change this with help from the next generation — such as CSUN students. “Our generation, the millennials, if we don’t curb our habits of screen time, according to the surgeon general, we’ll be the first generation to lower our life expectancy,” Torres added. 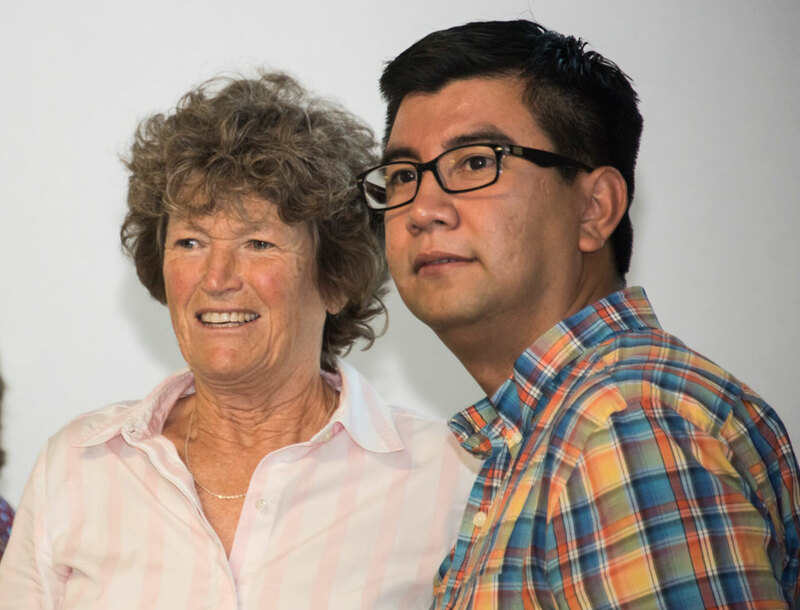 She noted that she tries to encourage young people and their families to use technology as a resource, not a barrier. She cited the stargazing and constellation-spotting app that she uses on her cellphone as an example. Sustainability Day, a half-day symposium, also featured a screening of A Fierce Green Fire, a documentary on the history of the environmental movement, and a presentation by CSUN geography professor Amalie Orme and civil engineering and applied mechanics assistant professor Sami Maalouf on Your Water: Now and the Future. “The present drought is not over,” Orme told the crowd of hundreds of CSUN students, many of them attending the morning session with their classes — part of the minor in sustainability offered by CSUN’s Liberal Studies Program. “One storm does not alleviate the presence of our drought.” With Maalouf, Orme explained the climate events that led up to California’s drought, such as persistent “ridges” of high pressure, and how long it could last. Maalouf talked about groundwater recycling and reuse systems, as well as the impact of desalination plants on near-shore marine environments. “Perhaps [desalination] is a great feat of mechanical engineering, but it has to work in unity with the environment,” Maalouf said. Compared to those costly plants, recycled municipal water and increased efficiency of urban water use are Southern California’s most critical tools for water conservation and change, he said. Sustainability Day participants also gathered to discuss and promote recycling, cutting energy use and other aspects of sustainability on campus and across the region. The Institute for Sustainability helps coordinate these efforts with Associated Students and other campus organizations, said Helen Cox, director of the institute and a professor of geography. In addition to Sustainability Day, the institute sponsors an annual Water Day symposium and campus Earth Day celebration in the spring, and semi-annual campus Orange Picks in CSUN’s historic orange grove, benefiting local food pantries. For more information on the Institute for Sustainability, go to www.csun.edu/sustainability.